A Kindle that never needs charging? Here’s a new rumor about a truly amazing possibility, like something straight out of a science fiction story about futuristic new technology. Amazon may be working on a super-light Kindle — which may never, ever need to be charged — and which could even be incorporated into transparent surfaces like the windshield of your car! And crazy as it sounds, at least part of the story has already been confirmed. You can actually read Amazon’s description for this new technology online in a patent application that they’ve filed with the U.S. government. 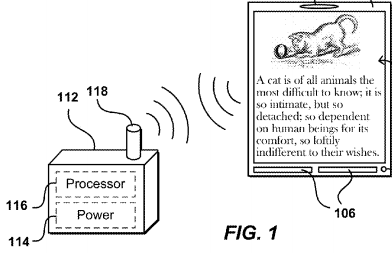 The magic happens by transforming the Kindles that you’d hold into your hand into a simplified “portable display” device, according to the patent. These lighter hand-held Kindles would just need to communicate with another larger “station” which would handle all the heavy computational tasks (like transmitting the text of your Kindle ebooks). This ultimately means your hand wouldn’t have to hold up all the extra computer circuitry that’s required now for displaying ebooks on your Kindle’s screen. But besides transmitting data to your Kindle, these stations might even be able to transmit electricity to your Kindle, meaning that while it’s receiving the text of an ebook, it’s also receiving the power to display it! Even your eyeglasses could start receiving data transmitted from Amazon’s system, according to their patent application. Having a light, simplified device means that “the user can utilize the glasses as a display screen when desired,” Amazon writes. And since that display is receiving data, Amazon’s imagining more than just ebooks being transmitted, and suggests that their devices could ultimately become “an earpiece that allows a user to hear audio information and/or provide audio input.” That sounds like a new kind of phone/Kindle combination that doesn’t even require a phone or a Kindle. And Amazon points out that the station could also transmit power to these devices — possibly creating a new mutant kind of phone which would never need to be re-charged. It’s a fascinating reminder of just how quickly our world has been changing. 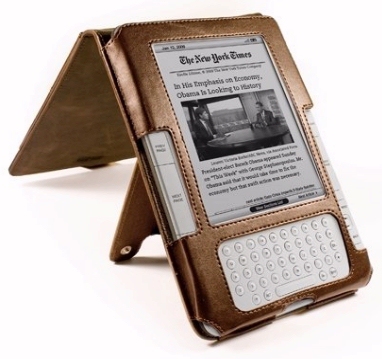 (One technology blog speculates that Kindles might even become “as thin as the paper they replaced”.) But it’s even possible that Kindles might disappear altogether, leaving nothing behind but the words from your ebooks, being transmitted into your eyeglasses, your watch, or the windows of your car. I love these “what if” moments, where you wonder what new technologies might be coming in the future. And it looks like someone else is wondering very seriously about that too. The multi-billion dollar company that invented the Kindle….